Fully accredited staff. In-home visits at no charge. Larger selection of orthopedic shoes than any other area provider. Digital casting for orthotics and digital measurements for shoes ensures accuracy and closest possible fit and decreases wait times on special orders. We offer many different types of products including custom-made orthopedic items. If you don’t see the item you are looking for listed, please call and we will be glad to help. 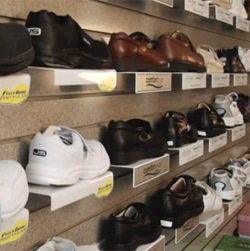 We offer more choices than any other diabetic footwear provider in the area. Diabetic shoes are a preventative measure that has been shown to reduce the occurrence of ulcers, amputation, and other diabetes related complications. We specialize in providing the highest quality diabetic shoes available. We are highly trained in implementing the proper fit for custom shoes and foot orthotics. Ambulatory products-Canes, crutches, walkers, etc. Manual and powered rehab chairs by Quantum Rehab, Medline, and Invacare. Our store has accredited foot orthotic professionals that can design custom foot orthotics. We also save you money compared to what other providers charge for custom foot orthotics.